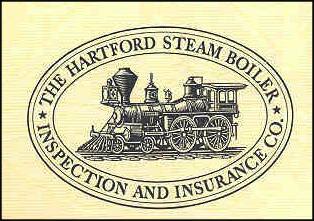 Beautifully engraved certificate from the Hartford Steam Boiler Inspection Insurance Company issued in 1972. This historic document was printed by the Security-Columbian Banknote Company and has an ornate border around it with a vignette of a steam powered train. This item has the printed signatures of the company’s president and secretary and is over 36 years old. 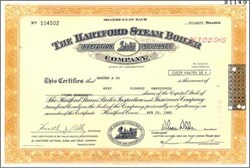 Certificate Vignette The Hartford Steam Boiler Inspection and Insurance Company, the world's leading equipment breakdown insurer, is a global provider of specialty insurance products and engineering consulting services. Hartford Steam Boiler was founded in 1866 to provide loss prevention service and insurance to businesses, industries and institutions. Based in Hartford Connecticut, Hartford Steam Boiler (HSB) is one of the world’s leading insurers and reinsurers of equipment breakdown insurance. HSB is a global provider of specialty insurance and reinsurance products, inspection services and engineering consulting. Operates in the US, Canada, United Kingdom, Australia, Europe, Far East and Latin America. The Hartford Steam Boiler Inspection and Insurance Company is rated A+ (SUPERIOR) by A.M. Best Company in financial size category Class IX. HSB services over 2.2 million insured locations. HSB distributes a range of specialty coverages through property–casualty insurance companies, insurance agents, brokers and managing general agents. HSB has reinsurance relationships with more than 200 premier property-casualty companies. Half of HSB’s staff are engineers and inspectors who help clients understand risk and maximize the reliability and efficiency of equipment and processes. HSB is the largest authorized inspection agency accredited by the American Society of Mechanical Engineers (ASME). HSB owns the world’s largest technical database on equipment failures and causes. HSB Group, Inc. is the parent company of The Hartford Steam Boiler Inspection and Insurance Company. HSB Group, Inc. is a wholly owned subsidiary of American International Group, Inc.
Reinsurer Munich Re AG on December 22, 2008 said it would pay $742 million to buy Hartford Steam Boiler from its embattled parent company, American International Group Inc.
Munich Re said in a statement that it planned to complete its purchase in the first quarter of 2009. HSB, based in Hartford, Connecticut, is a specialty unit focused on engineering insurance and inspection. Peter Roeder, a Munich Re board member responsible for U.S. business, said HSB was an attractive, low-risk investment because of its specialized business. "The acquisition of HSB is a perfect fit for our U.S. strategy," Roeder said. "It is another step in developing our position in high return specialized niche segments." The U.S. government is forcing AIG to shed or sell some interest in units globally as a means to pay back part of a bailout loan.